Is This The Beginning of a New Trend? Elevation Chiropractic Dr. Colpitts D.C. Can help with an effective gentle and relaxing approach. Bottom Line: A recent scientific study demonstrated that 73% of the people experiencing acute low back pain and used both standard medical care AND recommended chiropractic care experienced either significant improvement or complete relief vs. 17% of people who just used standard medical care. That’s a remarkable discovery. This might just be the beginning of a new trend in science focusing on how to help people get well and stay well naturally through methods like pro-active chiropractic care along with standard medical care. We might soon discover a wide range of possible health concerns that people could experience significant improvement or complete relief from? Why it Matters: In the day and age where medical debt is the number one cause of personal bankruptcy, any advantage you can give yourself to get well and stay well naturally is of huge benefit to you and your family. That’s our goal for you and why we share the latest science and research that we believe should matter to you. Why do people experience significantly better results when adjustments are added? Well, chiropractic adjustments focus on correcting the cause of your pain or problem versus just medicating the symptom away. The objective is to find and correct the reason you’re experiencing your problem versus just tricking your body to not be inconvenienced by the signal your body is giving you that something might be wrong inside. Chiropractors believe that pain means to pay attention inside now. Want to stay active? 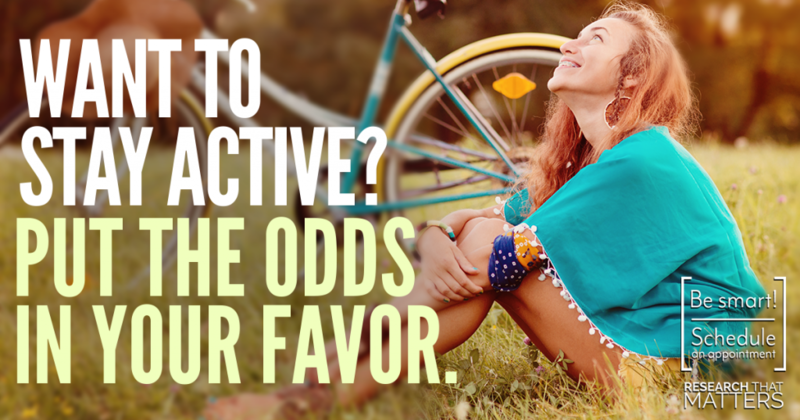 Put the odds in your favor.